Magnetic Rolling Chalkboard with Aluminum Frame. This chalkboard is constructed of Porcelain Enameled Steel (50-Year Manufacturer Guarantee). 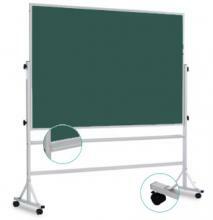 The rolling chalkboard frame is made of Anodized Aluminum. The double-sided chalkboard rotates 360 Degrees and and locks into place. The heavy-duty anodized aluminum frame sits on locking rolling casters (wheels) for added mobility. A full-length chalkboard accessory tray is included. Choose your chalkboard size and color, black or green (recommended). Easy Assembly. Assembly tools included.